These are lyrics by Kasey Chambers that we think are kind of nonsensical. 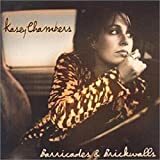 Kasey Chambers', "Not Pretty Enough"
This doesn't make sense because the singer is female. However, it could mean something different.